Already a potent and hot round in the minds of most shooters, this is the round that takes the 9x18 Makarov to the next level for those who prefer to use it in a dedicated personal defense role. 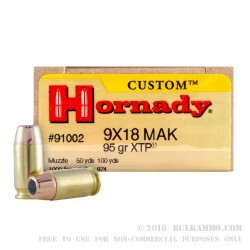 The ballistic numbers are impressive form this small round and the Hornady custom round helps it all make sense with the 95 grain XTP projectile which is an elite performer in the self-defense space. The velocity of the round is 1000 feet per second out of the muzzle and it achieves 211 ft. lbs. of energy at the bore. The premium Boxer primed brass and clean powder mix makes it a great reloading candidate for those who want to mess around with handloads for the 9x18mm MAK. 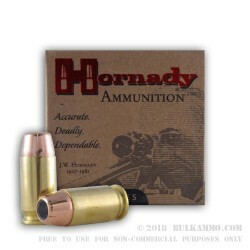 The Hornady custom line is a brilliant offering that caters to specific attributes of each of the rounds it showcases in the product portfolio, by finding the attributes most interesting to the general use of the round and intensifying that attribute to enhance overall performance. 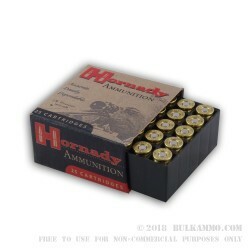 In the case of the MAK, the Hornady custom load improves upon its already solid ballistic performance for such a small cartridge.